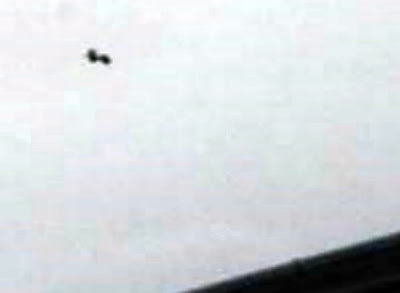 A keen-eyed Wiganer has captured this UFO in the skies above Wigan on his video camera. The man in his 30s, who only revealed his first name as Geoff, filmed the strange object hovering near to junction 27 of the M6 at Shevington Moor last month. So shocked at what he saw he didn't know who to tell or what to do with his footage until he showed it to a friend, who urged him to contact the local press to see if anyone else had reported it. The footage clearly shows a strange object hovering in the sky for several minutes before vanishing into thin air. Geoff said: "I was driving through Shevington when I noticed something out of the corner of my eye hovering above some houses. My first thought was that it was a helicopter, but after a while I noticed it wasn't moving at all and wasn't making any sound. And it looked to be in two pieces. "I pulled over and kept watching it and it was the strangest thing. Then a chinook helicopter flew close by, followed by another type of helicopter – it might be me but they seemed to be checking it out. "I had my video camera in my car with me, so I took some footage of the object. It was there in the sky perfectly visible then it just disappeared from my viewfinder." This sighting is the latest in a long line of sightings from across the country of strange objects in the sky, but it is made all the remarkable because it is captured on film. Last year a young man from Hindley captured a UFO on his mobile phone whilst standing outside his local pub, but the footage is poor compared to Geoff's amazing video. "I've shown it to a few people," said Geoff. "Some think it's a UFO, others think it's just a kite or balloon. But if it was a kite where was the line and how on earth was it so still for that length of time – and where did it disappear to all of a sudden? "I don't particularly believe in little green men and all that, but I am open-minded enough to know that whatever it was, it was not a conventional flying machine." "The UFO Subject is Alive and Well"